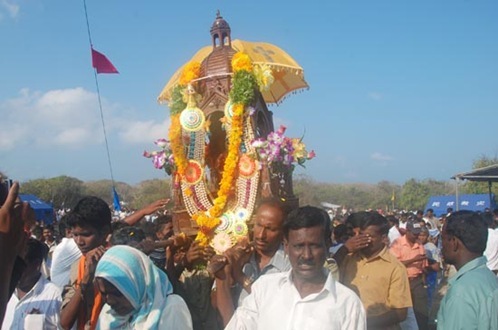 This year Indian fishermen attended the Annual Feast of St.Anthony’s church, at the Kachchativu (Katchatheevu) Island on February 27 and 28 as the war on terrorism is over in Sri Lanka. The feast was attended by both Indian and Sri Lankan fishermen and devotees. Due to war against terrorism, the feast was not attended by Indian fishermen since 1983. Indian Coast Guard and the Sri Lanka Navy coordinated the event successfully. Kachchativuwhich is located (9°23′ N, 79°32′ E) closer to Indo-Sri Lanka International Maritime Boundary Line (IMBL). St Antony’s (Anthoniyar) Church was established in 1905 in Kachchativu. As per the 1974 Treaty between India and Sri Lanka, the Island was ceded to Sri Lanka (by India) ensuring the free access for the pilgrimages from India. 3387 Indian fishermen and devotees left Rameshwaram in 114 boats on February 27. Local devotees numbering 824 also participated in the feast. Here is a photograph of the annual feast from Sri Lanka Navy. Read more from The Times of India and the Sri Lanka Navy (also view more photographs).